The new walnut Hub Edition Base Station is the same as the one we previously reviewed, but with a new walnut exterior. It retains all of the features we were enamored with such as the multiple charging coils and dual USB outputs. Let's quickly point out a few of the highlights. On the front is a series of status LEDs to let you know if your devices are charging. One of our favorite little touches is that these LEDs will dim in the dark thanks to an ambient light sensor around back. 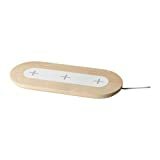 This stops the lights from blinding you bedside. The back has a 7.5W USB-A port -- which we use for our Apple Watch charging puck -- as well as an 18W USB-C port -- which we use to charge our iPad. This is a nice combo of ports that are quick and power all our gear from this one hub. Using the new wireless second generation AirPods Charging Case, users can also charge those on top side by side with an iPhone. It isn't necessary to rehash the entirety of our previous review, so instead, we will focus on the new design and material. The standard version of the Base Station is crafted largely from metal with the leather charging pad in the center. This model swaps out most of that metal for a walnut frame instead. One of the greatest benefits of using wood is unique grain, particular to every cut. No two of these chargers will ever be precisely the same, and will be uniquely yours. Walnut is a great option as it has a dark tone and Nomad has only minimally treated it to mesh well with the black leather. We did notice that this charger has less weight to it than the original, due to the lighter density of the wood. This isn't a problem, but we did have it shift around our table more than the metal model. Walnut covers the whole top -- sans the leather portion -- and wraps around the sides, including the rear ports. As the Base Station curves to the bottom, the wood ends leaving way for the plastic coverage and rubber feet. You can't see the bottom so we don't mind the trade-off here. The biggest downside, as we said with the original, is that you still need to use an external Apple Watch charger as one isn't integrated. 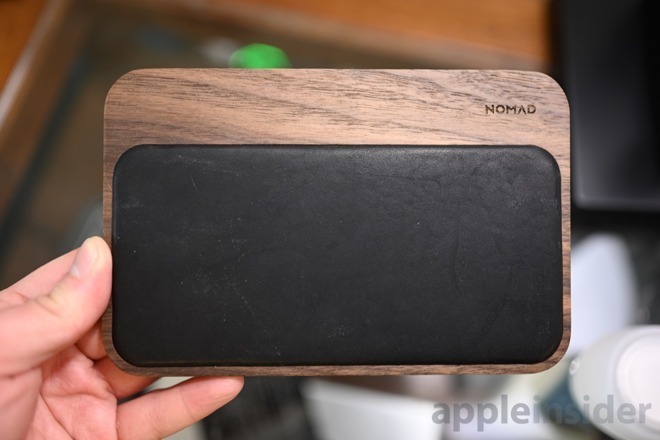 Nomad did launch a Base Station + Apple Watch model, but it isn't available in the wood finish. Personally, we like the wood, so we prefer to use an external charging puck and the luxurious wood Base Station. Especially with the high price point, people are going to draw natural comparisons to Apple's own AirPower charging mat that is expected to launch very, very soon. There are quite a few differences between the two, and each have their own perks. The Nomad Base Station can handle four devices at once rather than the three max of AirPower. AirPower also is (likely) limited to 7.5W of wireless output per coil, whereas Nomad can put out 10W on each coil. If you have another device that can handle up to 10W, Nomad has the advantage. With the added USB outputs, Nomad can charge devices like iPads, of which AirPower has no answer for. Nomad also has a much more premium finish using natural materials such as leather and walnut. Depending on your style, you may prefer Nomad's design or Apple's clean white look. AirPower really shines when it comes to iOS integration and placement. There will be no fiddling with precise location of coils, and a device can be set anywhere on the mat and will start charging. 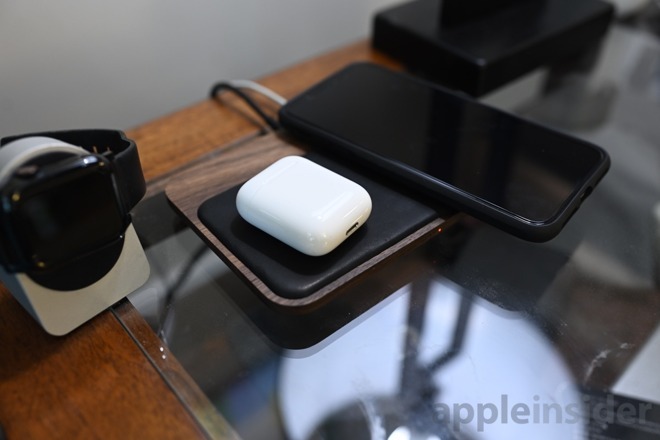 When an Apple Watch or AirPods are also set down on the AirPower, the iPhone will spring to life with a simple animation and charging status for each of the devices. What matters the most, is up to you. Nomad charges a $25 premium for wood over the metal, bringing it to $124.95. This doesn't make it a cheap charger, but it is arguably the best look one we've come across. 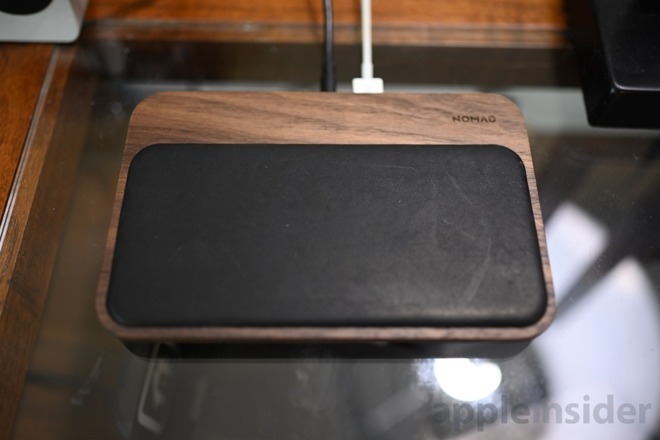 If you want to elevate your wireless charging experience, grab the Nomad Walnut Hub Edition Base Station from their website. Glad you got this article out before the AirPower comes out (tomorrow?). 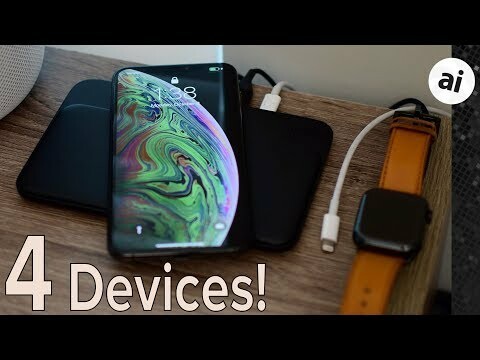 It's nice to have options, but ... my inclination is that if I'm not going to buy the AirPower for some reason, a better use of my money would be an inexpensive but good-quality (think Anker for example) Qi charging pad large enough that it has two coils -- one for my iPhone 8, the other for my future purchase of the new AirPods w/wireless charging case. I'll cope (somehow) with having to place them in the right spots to charge. Personally, I find the best excuse for this is the number of items it can charge. It can handle four devices and fast. 10W Qi, 7.5W USB-A, and 18W USB-C. AirPower can do two phones, or three devices if they are smaller. Your iPad is still going to need another charger. I like having it all tucked together. Awesome review! But, i was wondering what awesome case was used on the iphone in the pictures featured in the article! Thanks for the review, they are very helpful. I can’t for the life of me fathom why anyone would be enamored with a lay-flat charger for iPhone. The balancing act is inconvenient, they easily fall off, and can’t be viewed from bed. The stand-up style is far and away a better solution for iPhone wireless charging. 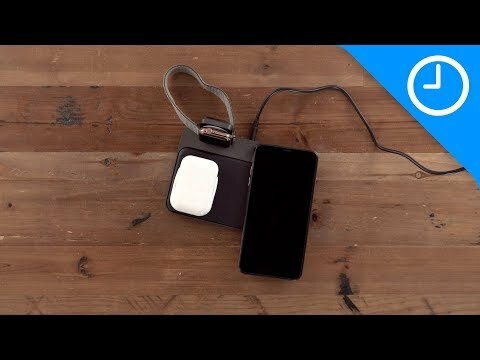 a better use of my money would be an inexpensive but good-quality (think Anker for example) Qi charging pad large enough that it has two coils -- one for my iPhone 8, the other for my future purchase of the new AirPods w/wireless charging case. I'll cope (somehow) with having to place them in the right spots to charge. take a look at an Ikea Triple Pad - three wireless coils PLUS a USB-A port for an iPad etc. Available in birch too - i've got one some time ago and it works great, has some 'crosshairs' so easy to see where to place your phone etc. That says more about your limitations than another's particular use case. The balancing act is inconvenient, they easily fall off, and can’t be viewed from bed. Also about your limitations with some FUD thrown in for good measure. Balancing? Falling off? Get real. It's possible to knock it off, I suppose. Fall off?Yeah, right. Not everybody needs to see the phone once it's lights out. I have the phone on DND at night time. If anybody gets past that it'll be someone I need to talk to, so seeing who it is before I pick it up isn't at all necessary. Not a thing. The stand-up style is far and away a better solution for iPhone wireless charging. Yet again somebody tells the world their way is the only 'correct' way and any other way couldn't possibly be right for anybody. Geeze. 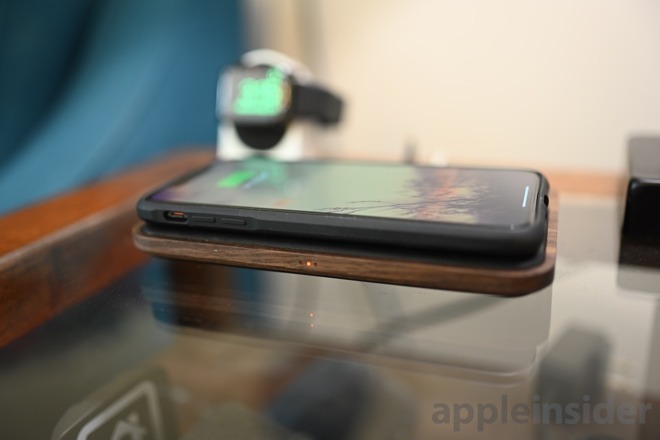 I like the walnut stand and would like to see it with either shade of brown as with the Nomad AirPod case. But it's a little pricey as is. Really nice looking though. Nomad has an even better charger. It's their Base Station Watch Edition.